The Ancient Mariners follows nautical archaeologists as they excavate three shipwrecks in the depths of the Eastern Mediterranean and as they analyze their finds in the laboratory. The three ships, dating from before 300 B.C. to 1025 A.D., tell the story of a significant change in the methods of ship construction - a change reflecting broader alterations in social, economic, and political conditions. At Serse Liman, Turkey, George Bass, the founder of the Institute of Nautical Archaeology (INA), led an investigation of a ship that sank in 1025 A.D. As we see it before excavation begins, the wreck is barely noticeable on the seabed; but the ship's cargo, mostly broken glass, appears as the archaeologist divers remove silt with an airlift. Showing the huge collection at Bodrum, Turkey, Bass explains that the ship must have been carrying glass for eventual recycling. Fredrick Van Doominck shows the elaborate methods for preserving the fragile pieces of the ship's hull on land. 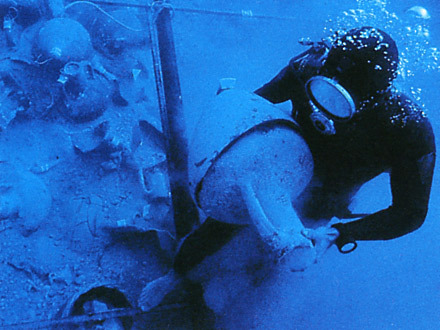 Michael Katzev, also associated with INA, excavated a Greek merchant ship that sank off Kyrenia on Cypress in the fourth century, B.C. The ship carried a cargo of wine in large amphoras. Richard Steffy learns from making a model of the ship that it was built quite differently from the Serce Liman ship. This "hull-first" construction process required not only more labor but a great deal more wood. Lionel Casson tells us that the craftsmanship of the Kyrenia ship was made possible by the use of slave labor, on which Greek society then depended. George Bass had earlier excavated another shipwreck near Yassi Ada, an island off Turkey, that helps to explain the change in ship construction. The Yassi Ada ship dates from the seventh century A.D. and its construction fell somewhere between hull-first and later frame-first methods. For after-viewing discussion: What do the three ships' methods of construction reveal about the general economic, political, and social conditions existing at the time each was built?